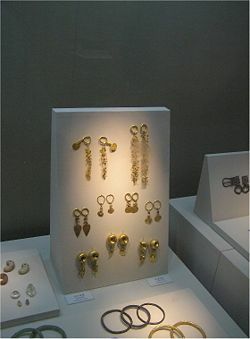 The ancient Korean kingdom of Silla used the aristocratic bone rank system to segregate society, particularly the layers of the aristocracy. The bone rank determined the basis of their hereditary proximity to the throne and their level of authority. The idea of royal blood in other societies relates closely to the idea of sacred bone in Silla thought. Strictly hereditary, the bone rank created and sustained a caste system. The bone rank may have been adopted as part of the administrative law introduced from China and promulgated by King Beopheung in 520. That merely reinforced a society already segregated by bloodline and lineage. Although only two of the five known ranks referred to "bone" (골, 骨), the term "bone rank" has become widely used to describe the whole system. Relationship of Bone-Rank Gradations in Silla to Office Rank and Post. A person's bone rank status governed not only official status and marriage rights, but also the color of one's garments and the maximum dimensions of one's dwelling and carriage. The twelfth century Korean historian Samguk Sagi described in detail those criteria particularly its Monographs (ji 志), book two (ranks and offices). The Samguk Sagi's depiction of Silla life has often been criticized for being excessively static. Unfortunately, the Samguk Sagi alone survived intact, making difficult the judgment of what sort of changes may have taken place in the bone rank system over the centuries. The "sacred bone," or seonggol (성골,聖骨), sometimes termed "hallowed bone," constituted the highest level of the bone rank and applied only of a portion of the royal Kim family, possibly those considered to have royal blood on both sides. The "sacred bone," or seonggol (성골,聖骨), sometimes termed "hallowed bone," constituted the highest level of the bone rank and applied only of a portion of the royal Kim family, possibly those considered to have royal blood on both sides. Until King Muyeol abolished rank with his ascension to the throne in 654, only those holding sacred bone rank could assume the throne. 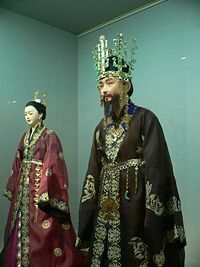 That led to the crowning of Queen Seondeok in 632 and Queen Jindeok in 647, because no males of the sacred bone rank could assume the throne. That situation may have led to the subsequent abolition of bone rank. Below the sacred bone came the "true bone," or jingol (진골, 眞骨), which included the rest of the royal family, as well as the Bak and Seok families of Gyeongju, which had held the throne in very early times and were involved in most royal marriages, as well as another Kim Kimhae royal clan lineage descended from the royal house of Kumgwan Kaya. Members of the true bone could hold any official position, up to the level of full minister. They could also attain office rank up to the highest, ibolchan (이벌찬). After King Muyol abolished under the sacred bone rank, only those holding the true bone rank could become king. Below the "true bone" came the head ranks (두품, 頭品), with only the sixth, fifth and fourth described, the sixth being the highest. The origins of those lower head rank classes and what defined one‘s status as such remain obscure, sparking debate among scholars. The royal court prohibited jingol from marrying into the lower ranks, though they could take concubines from them. One source mentions an aristocrat of the head rank six fathering children with a lower ranking concubine. In any case, members of the head rank six could rise to the position of vice-minister (gyeong, 경, 卿) and as high as the sixth level of office rank, achan (아찬 阿餐) (two higher ranks of jungachan 중아찬,重阿餐 and sajung achan 사중아찬,四重阿餐 later supplemented the achan but those still fell within the sixth level). Members of head ranks four and five could rise only to minor posts. Members of head rank five could reach the tenth level of office rank, daenaema (대내마, 大奈麻), while members of head rank four could attain only the twelfth level of office rank, daesa (대사, 大舍). Seventeen levels of office rank existed altogether. Lee proposes: "head-ranks three, two, and one, if they ever formally existed, must have designated the ... non-privileged general populace." The frustrated ambitions of the head rank six class in particular seem to have played a prominent role in the politics of the late Silla period. Many men of head rank six status, proscribed from rising too high in the Silla administrative system defined by the bone rank system, sought to bypass that by studying Confucianism (either in Silla or abroad in Tang China) or else turned to careers in Buddhism. Choe Chiwon, undoubtedly the most prominent of the head rank six figures following an illustrious career in China returned to Silla only to see his attempts at administrative reform rebuffed by an entrenched aristocracy. In the early tenth century the nascent state of Goryeo, which succeeded Silla, tapped into the head rank six intellectuals to man its bureaucracy. The bone rank system's extreme rigidity certainly helped to weaken Silla toward the end of the Unified Silla period, although numerous other factors came into play. After the fall of Silla, Goyeo abolished the bone rank system, although different and somewhat more flexible caste systems persisted until near the end of the Joseon Dynasty in the late nineteenth century. ↑ Lee, 1984, p. 43. ↑ Lee, 1984, p. 50. Breen, Michael. The Koreas: Who They Are, What They Want, Where There Future Lies. Online Retrieved November 7, 2007. Kim, Doo-jin. 1985. 한국사종합논저목록Shilla kolp'umje sahoe-wa hwarangdo (The 'Bone-Rank System of Shilla Society and 'Flower of Youth' Bands) . Korea Journal 25:2. Seth. Michael J. 2006. A Concise History of Korea: From the Neolithic Period Through the Nineteenth Century. Rowman & Littlefield. ISBN 0742540057 Online Retrieved November 7, 2007. History of "Bone rank system"
This page was last modified on 15 June 2016, at 19:37.